A group of American manufacturers has developed a new strategy to get their message to President Trump. Knowing that the president regularly watches a handful of programs on Fox, a trade organization has bought airtime for 30-second ads during the president’s favorite shows to promote the group’s messages. Bloomberg reported on a campaign from the Association of Equipment Manufacturers (AEM) that debuted this month and encourages Trump to follow through on his campaign promise to create a massive national infrastructure spending program. 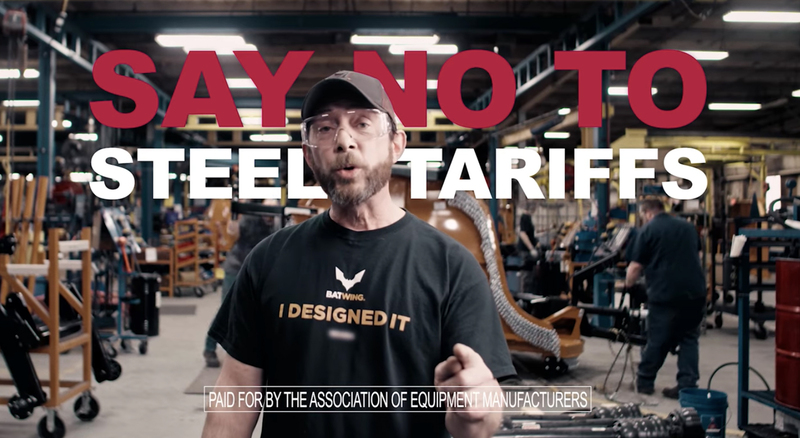 The ad plays a clip of Trump’s campaign victory speech when he said, “We’re going to rebuild our infrastructure.” Another AEM ad from earlier this year encouraged the president and congressional leaders to reject steel tariffs, saying that they would harm equipment manufacturers. The clips show blue-collar workers speaking directly to the camera, often explicitly addressing the president. The steel tariff ad begins with a worker saying, “Mr. President, thanks to you, equipment manufacturing right here in Illinois is growing stronger.” After a bit more ego-boosting, the workers then say that tariffs would undo the support that the president has shown industrial workers. Trump is known to be an avid television-watcher and reportedly insists on watching several Fox programs every day. The spots will run during programs like Fox and Friends, The Sean Hannity Show, and Tucker Carlson Tonight. According to Bloomberg, AEM plans to spend $250,000 on the infrastructure campaign.